Considered as one of the most challenging treks in Nepal, the Manaslu Circuit will reward the adventurous with an unparalleled alpine experience. Opened in 1992, this area offers a combination of rich culture heritage, unsurpassed beauty, and biological diversity. We ascend the Gandaki River valley, which is fed by innumerable rivers and waterfalls, offering the chance of a plunge into some bathing pools. From here, the streneous section begins and yaks begin to out number people in the rocky landscape. In Samagoan (3450m) we visit the glacial green lake of Birendra, before crossing into mystic Samdo, a mere 15km from the Tibetan border. Here Tibetan monks inhabit sacred monasteries and combined with the views of the Tibetan plateau against stark white Himalayas this is a truly spiritual place. The biggest challenge then awaits - crossing the snow bound Larkya La pass (5213m). Snow-covered peaks over 6500m towers above as we cross. The descent, once off the snow, takes us through alpine then tropical areas, bursting with ferns, bamboo, pine trees, waterfalls and aqua-blue green lakes laced with cotton-white beaches. Finally, Manaslu will disappear as we descend to Besisahar (832m.) 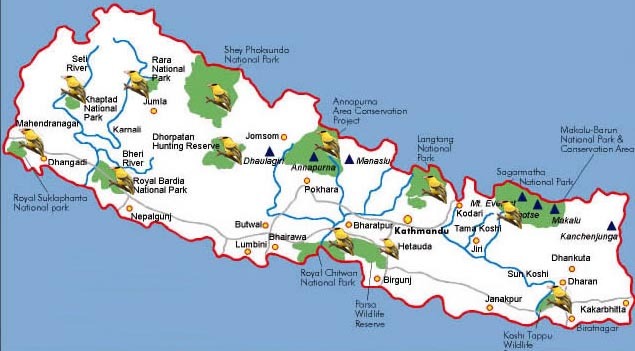 This 3week excursion will leave you with a sense of peace and respect for the people of Nepal and its ecological wonders. Views of Tibet and an insight into Tibetan culture through various monasteries and Tibetan settlements. Unspoilt mountain views, bathing pools, lakes and waterfalls surrounded by alpine and tropical forests. This itinerary is intended as a working guide only and is subject to variation as a result of weather, local conditions, government restrictions, or any other reason beyond the control of Mountain Club. We reserve the right to alter (lengthen or shorten) any trek at any time if this is necessary also trip can be shorter like drive to Arughat now a days on gravel rough road via Dhadhing crossing Aakhu Khola. Half day Sightseeing around Kathmandu. O/N in Kathmandu. Drive towards Pokhara and turn to north from Malekhu Bazaar and overnight at an ancient town Arughat Bazaar via Dhading. Camp along side of Budhigandaki River beyond the Arughat Bazaar. Trek head north, following the Budhi Gandaki. In the low country path surrounded by rice paddies and picturesque hamlets. After climbing briefly to Kyoropani, path descends once again to the river and our camp site at the confluence with the tributary of Soti Khola. It is not a long day, and perhaps we have time for a refreshing swim sometime during the day for it is hot in the low country. The country changes, the broad valley narrows and at times the trail is cut into the steep valley side, which is densely forested. We pass a number of small villages, tucked into the hillside, until we reach a widening of the valley, opposite the point where a large tributary stream enters the Budhi Gandaki. The terraced farmland here belongs to the village of Lapu besi. Trek descends once again to the wide, sandy riverbed and follows a path, which runs below the steep, craggy valley side. At length, we have to climb up once again on a trail to Macha Khola. We camp outside the village, which has a number of teashops. We cross the Machha Khola- Fish Stream- and head upstream to the tiny village of Khola Bensi and the hot springs at Tatopani (which I want to investigate). The valley sides steepen until they are impassable and the route then switches to the left bank by way of a suspension bridge. The trail is quite exposed and challenging in places. After a short section of forest path we reach the single tea house at Doban. Above Doban, the Budhi Gandaki descends an impressive series of rapids. Beyond this steep section, the river is much more placid, meandering across a broad gravel bed. At Lauri, we recross the river on a suspension bridge and then climb on a high path to the fields of Jagat, where we camp. After descending a long series of stone steps to the river,trek climb a terraced hill to Saguleri, from where we can see the impressive Sringi Himal, 7187m. Crossing the river again, at Gata Khola, the path splits, with the right–hand branch heading off towards the Mustang. Our route continues upstream, through a gorge section with towering walls. We cross the river three more times in the next two hours to avoid difficult valley sides and then climb up over a further steep spur to reach the village of Deng, where we camp. The valley is still steep- sided and most impressive. We cross to the village of Lana, and start to see mani stones, a sure signs that we are entering high country Buddhist regions. After only about four hours we reach our camping place at the village of Ghap, which straddles the river. We have entered the Tibetan areas and the cultural change is obvious, and the climate change is also obvious the trekking is pleasantly cool now, as we start to fain the altitude. We gain altitude to take us into alpine territory and increasing mountain views. There are more mani walls and 3 more crossing of the Budhi Gandaki on our route to Namrung, where our permit is checked. Above this village the valley opens out and there are extensive pastures. Climbing climb gently now, and cross a large stream flowing down from the Lidanda Glaciers, and reach the Tibetan village of Sho, 3000m. 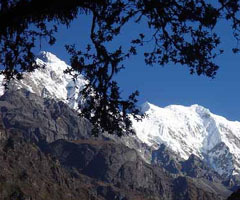 We camp just above the village we get our first incredible views of the Manaslu North and then of Manaslu main ahead. Let the exploring start! We will discuss with locals what our best option is to get to the gompa. Our sherpas reckon it could be a very nice walk to take the smaller direct trail…. We pass thru Lho, a large village at 3150m where there is a lovely little monastery and numerous chortens and manis. Looking back Ganesh I is visible. Leaving the village, we follow the right bank of the river, with views of Peak 29 ahead. At a fork in the trail, we take a detour to the left, which leads up to Honsansho Gompa and the Pungen Glaciers, from where there is a stunning view of Peak 29 and Manaslu. We will camp somewhere around here and explore and acclimatize for the next few days. Surrounded by mountains in a peaceful forest, we take a rest day to acclimatize and relax. It is a good time to catch up on that book or wash clothes. Now that we are more used to the altitude we take some time to have a good look around. We may camp higher in the valley. Descending to the main trail via a direct route, we soon reach the fields of Sama Gaon, 3500m. We camp at Sama Gompa, 20 minutes beyond the village, or Samdo, near the Tibetan border. The once large Budi Gandaki is now merely a stream as we continue to follow its course ever upwards. Everywhere you look is mountains, as spectacular as they get and Manaslu is particularly impressive. After crossing to the East bank of the river, we reach the last permanent settlement in the valley which is called Sumdu. Above the village we cross the stream which runs down the Gya La (pass), the pass to Tibet, and there is the ruin of another village here known as Larkya Bazaa. Presumably this village thrived on trade with Tibet over the nearby Gya La, a trade which is now much diminished. Nearing the Larkya Glacier, we reach a lodge at 4450m which has been built to serve the travelers crossing the Larkya La. Still climbing we take an easy day to admire the mountains. We camp by a lake. The valley system here is huge and well worth exploring – or perhaps you want a rest day? Below us is Bimthang, a broad and level ablation valley with a number of mani walls and deserted houses. Crossing this high pasture, we descend the valley of the Burdin Khola to the area of the Base camp for the West side of Manaslu. From a ridge at 4150m, we have excellent views of Manaslu to the South East and Annapurna II to the South West. Rhododendrons forests and follow a trail through a narrow valley until we reach the highest cultivated land in this valley at Karche, 2785 metres. We climb through terraced fields to the Karche La, and can see ahead a green and heavily forested valley, dropping down to the distant Marsyandi River. At thonje village is our final restricted area check post. Here we cross the Marsyandi River and join the main Annapurna Circuit, and the hoards of trekkers. Communities: The Gurungs are a distinctive and interesting ethnic group found mainly in the central hills. They provided the Gurkha army with many of its men and so occasionally your greeting of “Namaste” is returned in fluent English with a cheery “and a good morning to you”! Their religion is a combination of Hinduism, Buddhism and Animism. Wheat and maize form the main diet staple which is “Dhero”. Sometimes you may see groups of men carrying ancient muskets hunting game to supplement their diet. The people become more distinctly Buddhist as their links with Tibet increase. These are the Bhotia (from Tibet) who are similar to the Sherpa. Their flat roofed houses boast Gompas (monasteries) with embossed prayer wheels. Stone-built sacred monuments called Chortens often mark the entrances to villages. The last large village, Samagoan (also called Ro) is flanked by a long “Mani wall” carved with Buddhist prayers. (As a sign of respect for local beliefs always walk past, or round, Mani walls in a clockwise direction.